I became a driving instructor because I’m passionate about driving, and about sharing the skills of safe driving with learners, and the unique LD System of learning is a great and very effective way to learn. 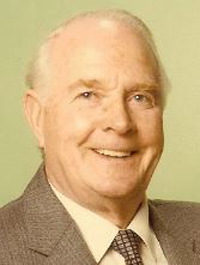 My grandfather, HJ “Reg” Digby, who died in 1998 aged 91, was one of the UK’s very first driving examiners. Back when the whole concept of driving tests was first introduced along side the Road Traffic Act of the 1930’s coming into force. It’s therefore, quite special to me to have the opportunity now to train the new drivers of tomorrow, as my grandfather did two generations back. 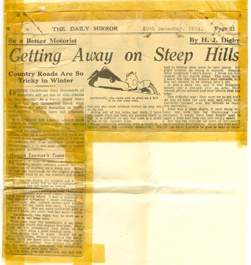 My grandfather, in his role as driving examiner, also wrote a regular motoring column for the Daily Mirror, called “Be a Better Motorist”. I have clippings of some of his articles - they give a fascinating glimpse into the world of driver training from yesteryear, and much of what they cover is still relevant today, but that being said, the driving environment of today is dramatically different from that of the 1930s. Driver training today is focused on giving new drivers the skills they need to drive safely in the 21st century. In the 1930s we had around 1.5 million cars on the roads in the UK; in 2015 we have 29 million cars licensed for use on the roads! I think my grandfather would be amazed at the range of tools available to learner drivers today to aid their learning – from apps and software to help learners through their theory test, interactive software to hone their hazard perception skills, and DVDs and workbooks to speed-up learning as a companion to driving lessons. I’ve been lucky enough to have the chance to drive many different vehicles since I began driving, including quad bikes, go-carts, transit vans and even tractors – driving alongside massive combine harvesters to collect the grain loads, and transporting huge loads of hay bales across town from one location to another! I’ve also owned many interesting cars, including one of the last classic Mini Coopers, and one that will always remain a favourite, an Alfa Romeo Sprint Green Cloverleaf, which accompanied me during a period spent living and working in the Jura mountains in Eastern France, where I had regular experience of driving the steep windy mountain roads and hairpin bends between there and Geneva in Switzerland, typically blanketed in deep snow in winter. I continue to be a big Alfa Romeo fan (or “Alfisti” as the Italians say), and I recently had the chance to participate in their Proving Ground event at Millbrook Proving Ground. 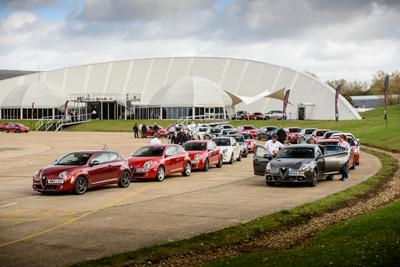 This is where the world’s top car manufacturers stringently test and refine their cars before launch on the market. I spent a very enjoyable day driving Alfa’s latest models, alongside professional test drivers and racing drivers, on the 100mph straight, high-speed bowl and their Alpine course, designed to faithfully replicate the twisty mountain roads I remember from my time in the Jura Mountains. 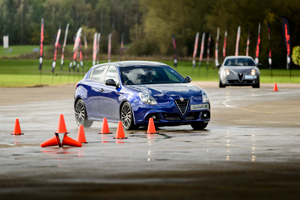 Practicing braking at high speed in the wet in the Alfa Romeo Giulietta on Millbrook’s skid pan was a great experience! I’m lucky to have the chance as a driving instructor to use my varied driving experience every day to coach new drivers in how to become safe and expert drivers themselves in all the various conditions and situations they may meet on the roads once they pass their test. I hope this helps to give you an idea about me and my motivations to teach you. Please feel free to get in contact with me either by phone or the email using the contact me button. 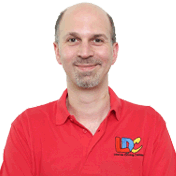 Thank you for the opportunity to tell you a bit about me and for considering me as your driving instructor.